As a business owner, it is quite likely that you have a great deal of systems in place that protect your business from harm. Your staff have contracts that protect all parties from misconduct, you have alarms and security cameras on the building to prevent theft, you use strong passwords to protect data and more recently, you will have updated your policies so they are GDPR compliant. But what happens in the event of an emergency? What do you do into these situations and how will that impact on your business? A Business continuity (BC) & disaster recovery (DR) plan will help to protect you from situations that have the potential to put your business into a critical situation. A good BC/DR plan will identify the maximum amount of downtime time that your business can handle using RPO & RTO, and put a series of processes in place to see that your entire business can be re-established elsewhere in the event of an emergency. In other words, business as usual. WHY AREN’T COMPANIES INVESTING IN BC/DR PLANS? DID YOU KNOW? 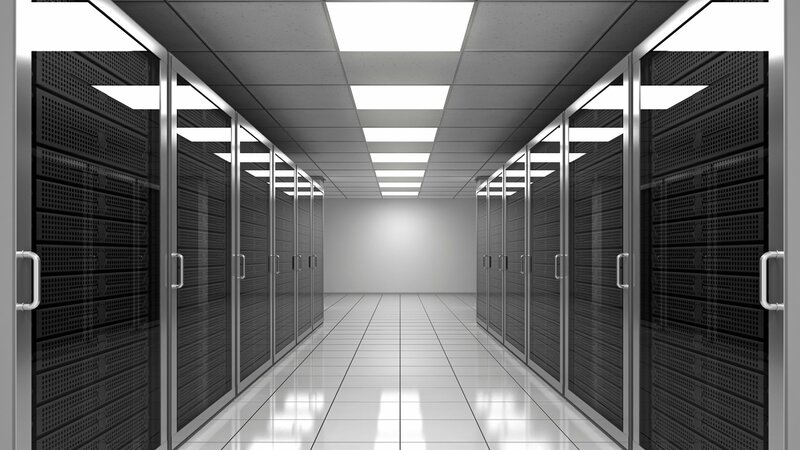 30% OF BUSINESSES HAVE NO BC/DR PLAN IN PLACE, AND OF THE 70% THAT DO, 60% OF THESE PLANS ARE INCOMPLETE. Budget Priority: A lot of the discussion that goes into disaster recovery planning focuses on how much of a company's overall budget, or an IT department's budget, should address disaster recovery and business continuity. Generally the average is about 0.1% for disaster recovery, and about 1% to 3% for business continuity. Regrettably, many budget items have higher priorities than business continuity, so it is not surprising that some organisations are reducing spending or not budgeting for BC/DR at all. Not understanding the risk: Risk can be calculated using the simple equation Risk = Likelihood (chance of disaster happening) + Impact (Disaster's effect on the business). The risk will vary from business to business and depend on many variables including the type of activities undertaken, the size of the organisation and the technologies used on a day to day basis. In our opinion, not having a BCDR plan is similar to having a boat without lifeboats. Yes, the chances of a boat or ship capsizing is relatively low, and investing in lifeboats is very costly, however the worst-case scenario must be considered, and sometimes life jackets just aren’t enough. WHAT ARE THE COSTS OF BC/DR? The short answer? Not as much as you think! The great thing about BC/DR plans is that they are relative to the size and activities of your company, meaning they should always be achievable and affordable. Factors that may influence the cost of your plan are as follows. It is also important to consider the costs of testing these plans with drills and how often your plan needs to be revised to ensure it is up to date. It is also quite likely that you will already have steps in place for your BC/DR plan, which also helps to reduce costs. All businesses are susceptible to disasters. Businesses that are not prepared for these disasters face a wide variety of risks, from customer dissatisfaction to financial losses. Not only can a disaster prevent the income of money, but it will also be costly to re-establish a fully functioning working environment. These in return will affect your reputation as a business and lose trust with your customers causing further financial loss. In extreme situations, a disaster could mean the end of your business. 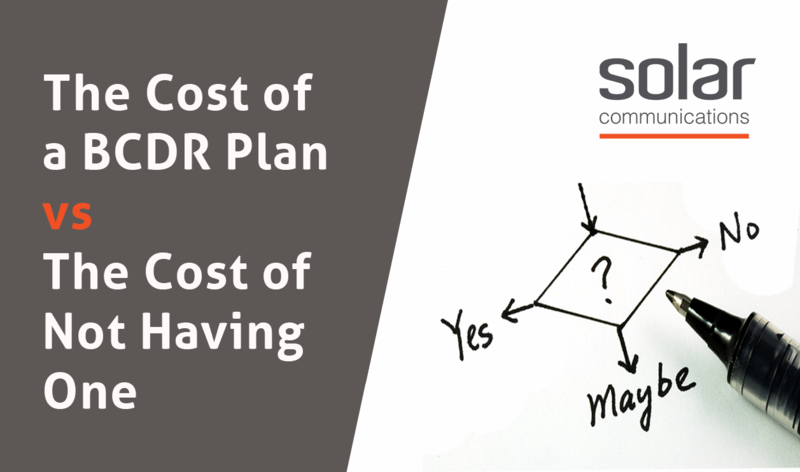 To understand the risks of not having a BC/DR plan, calculate the loss of revenue your business could lose should operations go down for a day, week or month. This would represent the minimum cost and once you start to factor in customer dissatisfaction, damage to reputation and loss of market share the cost can very quickly snowball. So there you have it! If you’re still not sure about investing in a plan, get in touch and discuss your concerns with us. We can help you to calculate expected revenue loss, provide you with BC/DR solutions, and provide training & support so that you can create and manage your own plan. 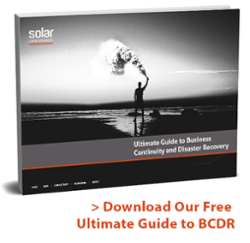 If you are thinking about managing your own BC/DR plan, or would like to learn more, check out our Ultimate Guide to Business Continuity and Disaster Recovery. Well, we would say that’s about enough of the doom and gloom, to end this on a high note, we will leave you with this positive statistic. DID YOU KNOW? 96% OF COMPANIES WITH A TRUSTED BACKUP AND DISASTER RECOVERY PLAN WERE ABLE TO SURVIVE RANSOMWARE ATTACKS. If you have no BC/DR plan when a disaster strikes, the cost to your business will be far more than financial. It will also impact customer satisfaction and reputation. Contact us for a free quote or to calculate revenue loss in the event of a disaster.